Games are fun, and stories matter. What happens when we cross the streams? Round 1, Fight! 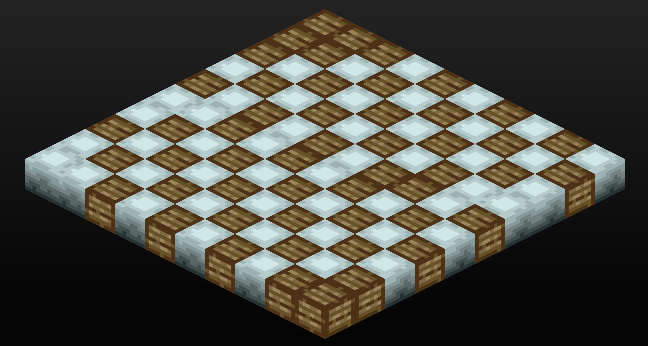 Recently I’ve been trying to show an AI how to create a checkered pattern on a tiled floor for a game. It seems to be learning, but still has quite a bit of trouble around the edges. The AI uses a generic problem-solving method called a genetic algorithm. Genetic algorithms are really cool because they can produce all kinds of awesome things without any previous knowledge about those things. In this case, it hasn’t the foggiest what it’s doing, but it’s just smashing various maps together and tweaking them trying to get closer and closer to my definition of ‘checkered’ that I gave it. The problem with genetic algorithms is that they have absolutely no idea what they’re doing. It doesn’t remember what it learned the last time it created a checkered floor (it just starts over again from scratch, tweaking and guessing). It also can’t handle much complexity. “Checkered” is a challenging enough concept, but something like “Ominous” would go right over its head for now. This entry was posted in Researcher by Machination. Bookmark the permalink. I'm naught but a humble casual player, dreaming big.